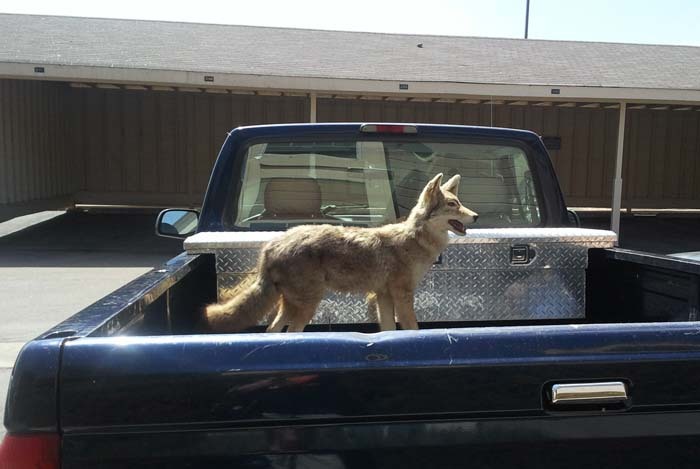 It's not everyday that you see a real coyote in the back of a truck. It made me look twice. 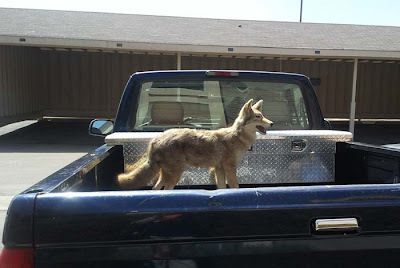 No fear, it's stuffed. I snapped this picture with my cell phone! Later today the Colorado Avalanche will be playiong their last game of the season against the Edmonton Oilers. It hasn't been a good season. They started out great last October, but in the past months wins have been few and far between. Hopefully they will do better next year. It's going to be hard. They are losing one of their best players. Adam Foote is retiring after today and he will be missed. It's the end of an era as he's the last player remaining from the team that moved to Denver from Québec City in 1995. I hope that the Avs can win this one for Adam. We were lucky enough to be at Friday night's game. Will certainly miss Adam Foote. Hopefully, next year will be better.